Heat oven to 375°F. Line 2 large cookie sheets with parchment paper. Microwave frozen spinach as directed on box; cool slightly. Squeeze dry with paper towels. In medium bowl, mix bread pieces and half-and-half; let stand 1 minute. With fork, mash bread until well blended. Add spinach, turkey, 3/4 teaspoon salt and 1/4 teaspoon pepper; mix well. Shape mixture into 36 (1 1/2-inch) balls. Unroll dough; separate into 12 breadsticks. Thread one end of a breadstick on 10-inch skewer; add 1 meatball, leaving 1/4 inch between dough and meatball. Repeat threading with breadstick and 2 additional meatballs. Place 1 inch apart on cookie sheet. Repeat with remaining breadsticks and meatballs. Bake 18 to 22 minutes, rotating cookie sheets halfway through bake time, or until meatballs are no longer pink in center and meat thermometer in center of meatball reads 165°F. 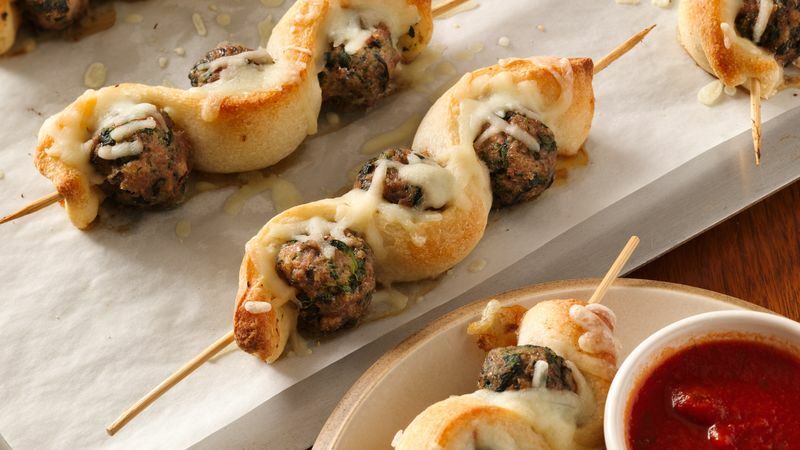 Sprinkle each meatball skewer with about 1 tablespoon cheese. Bake 3 to 4 minutes longer or until cheese is melted. Meanwhile, in 1-quart saucepan, cook sauce over medium-low heat 3 to 4 minutes, stirring occasionally, or until thoroughly heated. Serve with meatball skewers. 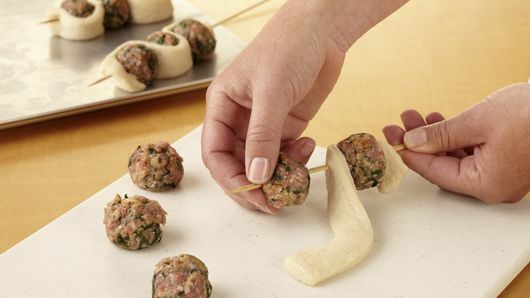 Use a 1 tablespoon cookie scoop to easily measure and shape meatballs.